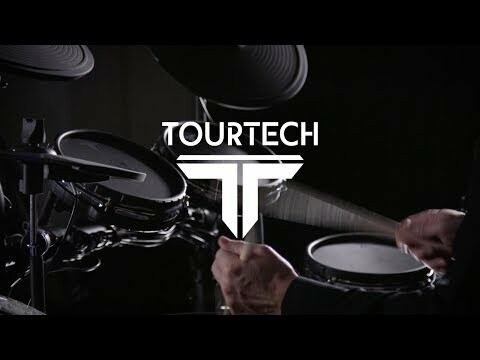 The TourTech TT-22M Electric Drum Kit combines responsive mesh heads, innovative technology and an impressive array of preset sounds to.. The TourTech TT-22M Electric Drum Kit combines responsive mesh heads, innovative technology and an impressive array of preset sounds to deliver pro-level response for the home or studio. All at a very reasonable price. By utilising patented non-contact technology, the Tourtech TT-22M's mesh snare trigger is far more reliable and reponsive than any other drum kit on the market at this price point! Mesh heads are typically a feature of high end kits with very high price tags. Here you have high end features at low end prices. The tunable mesh heads enable you to dial in the response and feel you want from each head, including the bass pad, to allow the most comfortable, realistic feel while playing. With both chokeable dual zone cymbals and dual zone mesh heads across the kit, this electronic set up has the responsiveness and feel of acoustic kits without the noise complaints. A feature that is again usually limited to costly high end kits, this kit offers these pro features at an accessible price point. The dual zone mesh heads allow you to trigger two sounds from one pad enabling you to play rim shots and cross sticks with ease. The dual zone cymbals offer the variety of bell sounds and edge wash, while also featuring a choke function for quick silencing of the cymbal sound exactly like an acoustic set up. Pro level acoustic kit functionality without having to bother the neighbours! With over 350 high quality percussion voices and 20 demo songs, you're never short of inspiration with the TT-22M. Use the intuitive sound module to scroll through 26 preset kits, or use the 15 user-defined custom slots to build your own. You can tweak each sounds' tuning and volume to your liking, and save it for recall later. The preset kits are well suited for a variety of styles like Pop, Funk, Metal and Electro. A great choice for function bands or anyone recording demos at home. Many of the samples and sounds within the TT-22M feature far superior decay times, making for a much more authentic, realistic playing experience that sounds great live or in the studio. With a full Audio, MIDI and USB interface, the TT-22M is well suited for pro players that want to do more than just practice. Use it as a MIDI trigger for software sounds, or record audio into your DAW with ease. However, if you're just starting out on your musical journey, the built-in Click Track (Metronome) and Song Playback functionality offers great training to learn the basics and master your craft. The Tourtech TT-22M also features a road-ready, sand-blasted frame stand, perfectly suited for life on the road or in a busy studio environment. You can thrash this until the cows come home, without worrying about it falling over or becoming unstable! Really is an great kit for the money. Proper mesh heads and the whole thing feels proper sturdy. Ive not gigged with it yet but I imagine it will hold up well. Loads of stuff to do with the module too. Cracking gear for the price!